Tracking this breed’s history has been a fascinating challenge. The youngest of the six classic Down breeds from England, its origins were the most obscure. 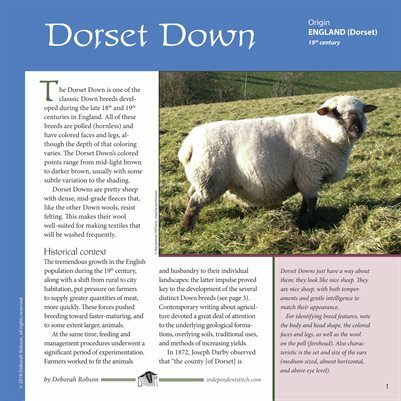 I wasn’t able to resolve questions about the Dorset Down when we were working on The Fleece and Fiber Sourcebook, so I was glad to have an opportunity to spend several months on the puzzle. Printed document plus free digital version; 8x8" publication, 8 pages. This document contains a combination of theory and practical knowledge for fiber arts enthusiasts of all skill levels. The handouts are heavily illustrated, because I find photos and diagrams extremely helpful to my understanding. Copyright: It takes a lot of time and significant resources to do this work, and I am self-supporting. Please honor the copyright. If you would like to use print or electronic copies for a group presentation or event or breed promotion, please get in touch about bulk pricing.